I've been stockpiling books with a sailing theme for a couple of years and have no idea what I have. There isn't a cover to look at, it's just a name on the Kindle page. We're truly Cruising now, so it's time to read those hoarded books. I chose the first one on the list, Finding Annie, by Michael Matthews. I expected nothing. I had no preconceived idea about what this book would hold. Maybe thats the best way to read a book, just jump in and be taken. The beginning of the book allowed me to go to a place where no one wants to go. It took me to "the loss of a loved one". 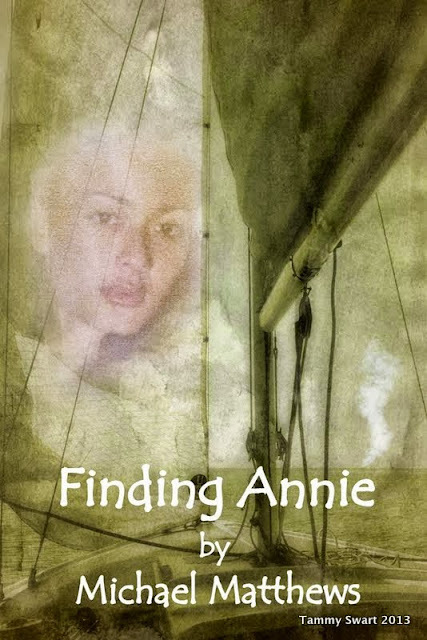 As a sailor, I welcomed the main character, Vic's finding solace in sailing. Although small boats are not my thing, I identified with his appreciation of the simplicity and peace that comes with living on a boat. While his reasons were far different from mine, I felt wise and all-knowing as I watched Vic find pleasure in the days at sea. At Sea: He took me to another feared place when he set out across the Pacific Ocean. Although I have no active plans to cross an Ocean, it could happen some day, and I need those wrinkles. Certainly, his crossing was uncommonly uneventful, but maybe it happens… until the event that changed Vic's life. I won't tell you what happens, but it was at this point that I became impressed with the originality of the story. So much so that it MUST be true! From this point, there were times when I thought to myself, life just isn't like that and he obviously has no idea… but as a story, it's nice to be taken along. The book becomes somewhat of a light romance towards the latter part, another unexpected turn for me. In my high school days, I read a ton of Harlequin Romances and I would compare it to these as the improbability and the happy ending cliches were difficult to ignore. But being written by a male, the perspective was the opposite of a Harlequin and there were no crushing love scenes to be endured. When I had finished the book, I found myself reading the dedications and "about the author" in search of confirmation that it could be true.. In the end, it was a light and pleasant page turner, short-but-sweet, and satisfyingly entertaining. It was the perfect "first book" to ease me into my new Cruiser life. I used to take many books with me on a military deployment and have more shipped while I was out. The last two trips before I retired, I had a Nook with a few hundred books loaded before I left. I enjoy a good adventure or travelogue. I've read a couple books by circumnavigators on sailing vessels big and small. I note you visited my home town of Mandeville (I've since moved away) and I will get to that story in time as I catch up.